Cloned from Nintendoid 1 by Patrick Lauke (redux). See also Super Mario Bros. NES by John Smith (CFP). 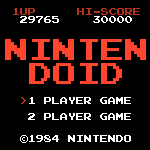 companion font to Nintendoid 1. once again, this is an amalgam, with a few alternative characters from further early nintendo games like RC Pro-Am, Galaga, and the lowercase from Metroid. Info: Created on 10th July 2012 . Last edited on 21st August 2014.